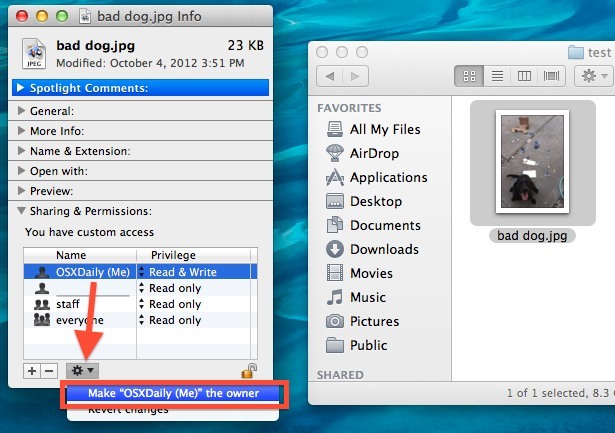 Though it’s somewhat rare to encounter ownership and permissions errors in Mac OS X, it can happen, particularly when an account has been moved, or a files owner has been modified by a third party application. Oftentimes you can just run through the process to repair user permissions, but that’s not always guaranteed to sort out a problem, and in some situations you need to adjust a files ownership directly on either a single document or a group of files before the intended user will regain proper access to the file. For these situations, there are two ways to manually change a files ownership, through the Finder and also through the command line. We’ll cover both, though for more advanced users the chown command is really much faster, and in some respects, it can be easier too. While going through the Finder is undoubtedly easy, it’s still several steps long and the Terminal can be faster in many ways. Don’t be intimidated by a command prompt, we’ll walk through the process and as you’ll see it’s actually pretty simple. Using the command line is generally considered more advanced, but for some situations it’s not only faster than going through the graphical interface, but in some regards it’s easier too. Here we’ll walk through the basics of changing file owners through the ‘chown’ command, which is standard in Mac OS X and also nearly all variations of unix. Launch Terminal from /Applications/Utilities/ to get started. Keep in mind that the user name you’re looking to use is the account short name, which is usually what a home directory is named after. If you’re not sure what the short user name is, type ‘whoami’ into the terminal to get the current short name, or type “ls /Users” to see a list of all user accounts on the current Mac. Again, you usually won’t need to change the files group, though occasionally you will run into a file that has somehow lost or misappropriated both it’s owning user and the access level group it once belonged to. Anyway, use whichever method is right for your needs, but for almost all cases of adjusting file ownership these days I launch the Terminal and use chown. That’s mostly a matter of preference, but I’ve never been a giant fan of the Get Info panels handling of ownership, though it’s usually fine for making quick adjustments to permissions. This should be a pretty rare thing these days, especially now that OS X 10.8 has the “Duplicate Files Exactly” feature now that maintains both ownership and permissions, even if files are outside of the reach of the user. Wonder stuff. Thank you. Question: How and why is there a four-leaf clover in your terminal command window? The period stands for the current directory. Super useful. I was handed a Mac for work and for some reason Terminal wasn’t saving my preferences (closing shell if exited cleanly and Pro as default theme). It’s not a common thing so I couldn’t find anything in Google. A guy found that the issue was that com.apple.Terminal.plist inside my preferences folder was owned by root and not by me. Another guy showed me that I can run sudo commands. Used both things, the command showed here for changing owner, and voilá. will this cmd change the ownership of the home folder to the current user? If so, does the $USER = $USER or the actual user name? I am trying to change the owner of the /user/lib folder. I have subfolders under this that I need to write to while installing stuff, and I am not able to do so, as I do not have permissions to write to the sub folders, and it is not allowing me to change the permissions of the sub folders as I am not the owner. It asked for my password, and still gave me an “Operation not Permitted” error. In the Info about the folder, it says the system has R&W, wheel has R and everyone has R.
It’s likely that you are running into SIP protection on those system directories, which are preventing you from having the ability to modify or change ownership of files or folders in those protected areas of Mac OS. You really should not be modifying /usr/lib/ or any other system level folder, things can go very wrong. Just be cautious, and backup your Mac first, as disabling SIP allows for unfettered modification of system components, which can render a Mac inoperable if something is haphazard or erroneous. Perhaps a good question is, what exactly are you trying to modify or accomplish? Are you trying to manually install command line software or something else? I have a hard drive that I used with Lion, but now I have reverted back to Snow Leopard, as I was having issues with Logic Pro 9. Files that I transfered to the said hard drive, will not let me delete the files as they are locked and I don’t have permissions. Because the errors you are encountering are broad it’s likely a broad permissions issue which is why Repair Permissions may be the solution. Later versions of MacOS removed the direct ability to repair permissions however.